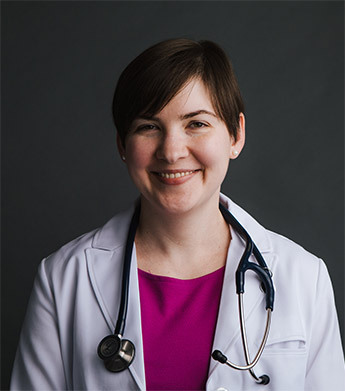 Dr. Jessica Zwiener is a board-certified endocrinologist in the Houston area whose clinic focuses on the unique needs of transgender patients. She has always been interested in gender identity, and during her medical training, she realized the lack of resources available to the transgender community. She opened her clinic, Braeswood Endocrinology, to fill this need. Dr. Zwiener has a deep understanding of hormones and hormone therapy, and is able to tailor a treatment regimen to your specific goals. She is comfortable using all types of estradiol and testosterone (including injections, topical creams, and patches), multiple different anti-androgens, and progesterone. Dr. Zwiener respects each patient’s autonomy over their healthcare decisions, and therefore prescribes hormone therapy under an informed consent model. In addition to managing the hormonal aspects of your transition, Dr. Zwiener will provide referrals to trans-competent surgeons, mental health professionals, and primary care physicians as needed. She is also happy to help you navigate the name and gender marker change process. In addition to transgender HRT, Dr. Zwiener also practices general endocrinology, and can help you manage diabetes, thyroid conditions, PCOS, or osteoporosis in a welcoming, non-judgmental environment. Everything at Braeswood Endocrinology is set up to make you feel comfortable, safe, and respected. Your preferred name and pronouns will be used, and you will always be treated with the highest level of respect. Dr. Zwiener provides Individualized care and personalized attention to all her patients. Your time is valuable, so the schedule is set up to minimize any time spent in the waiting room. Follow-up visits are available by phone call or video chat, so that you don't have to leave work, fight traffic, or arrange childcare to see your doctor. Medical bills can be expensive and unpredictable. Braeswood Endocrinology’s innovative membership model makes it easy to achieve financial control over your healthcare. For a consistent low monthly price, you can be assured that you will have access to your doctor when you need her – whether you need to come in for a visit, or whether you have a quick question that can be answered over email. No need to put off needed care or follow-up visits because of worries about the bill. Here at Braeswood Endo, pricing is transparent and affordable. Prices are significantly lower than those of most other traditional endocrinology clinics, and highly discounted rates on blood tests are also available to patients. Since Dr. Zwiener is out of network with insurance companies, your medical records will always be kept completely confidential; they will never be shared with your employer or any other third party, unless you request them to be. Dr. Zwiener earned a BS in Biochemistry and Cell Biology at Rice University. She completed medical school at the University of Texas at Houston, and went on to finish both internal medicine residency and endocrinology fellowship training also at UT Houston. In her free time, she enjoys working out at her local CrossFit gym, trying new recipes, and spending time with her husband, Jaime, her son, and her family and friends. For more information, or to schedule an appointment, please visit our website at braeswoodendo.com.